We would like the focus of the forum to remain ball jointed porcelain dolls, but we are open to including certain other types of dolls, especially if they do not currently have an English forum where they are on-topic. No matter what changes come, if any, we will always allow free discussion of any doll in the Tearoom (off-topic section). Please elaborate on your choices and reasoning in the comments. -Be an original work by an artist. Dolls with molds created entirely or partially from another artist’s work are recasts and will not be tolerated. Users found to be creating or promoting recast dolls will be banned. " My personal choice it to keep this forum to porcelain bjd dolls, because there are so many doll forums that talk about resin bjd dolls of all types. I was very excited that this forum was created because it is the place where we can talk, share and celebrate our porcelain dolls from different artists and not just one artist. It was exactly what i was hopping to see for a long time. I also chose the 3rd option, because it is also interesting to see resin dolls from artist who make porcelain dolls as well. I too think it should be at least 99% about jointed porcelain dolls. And while a few years ago I might have felt there was not enough subject matter, now there is plenty. But I still think it okay to have a thread about resins that porcelain doll artists have made, but only ones that porcelain artists have made. And I think it okay to include porcelain that has been painted by methods other then china paint. I also I like the epoxy porcelain that Olydoll uses, (though I don't quite understand what it is) or has she switched to regular porcelain? I would allow that too. I'm wondering about flumo. Sometimes artists use that as a stepping stone to porcelain, bjtales has made some very nice flumo dolls. I think that's okay too. But material other then porcelain should have their own threads and be kept separate from porcelain, except in group shots or comparisons. I think lilithskyblue expressed my feelings. The primary portion of the forum should be about porcelain BJD. Other dolls can be talked about on separate OT threads. My vote is similar to most here. I feel strongly that porcelain dolls are unique and special because of their material and process of layers of China paint. I think without these criteria it is not the same kind of doll. I am open to having a section for resin dolls only if they are not of a sort talked about on Den of Angels. I don't want to compete with the biggest forum!!! 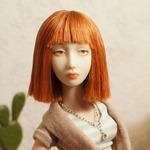 I think it's sad that some dolls (resin with painted eyes) have no on-topic place. Maybe we could do it here. But I don't want it all to be based on my opinion. I set up the forum just guessing what people would want based on what I like. But now that there are lots of people here I can try to find out what people actually want. It is encouraging to see people like the forum mostly as it is. Another possibility is expanding the Tearoom into several forums like Discussion by Artist, Gallery, Workshop...? I don't know what is best yet. I think having a section for non-porcelain dolls in the Tearoom would be nice... Would it be for any kind of doll? Or resin only? I don't know! D: It seems there are many votes for resin dolls by porcelain artists, so perhaps it would be for that? I'll let the poll run for a week or so and then talk it over with the other mods.